Zohreh Jooya's Crossroads project brings musical traditions together which at first glance seem vastly different in a startling organic way. New York and Kabul are 7000 miles apart but become neighbors in the fascinating world of this ensemble. The goal in this fusion is to combine jazz with Iranian and Afghan music in such a way as to create a new identifiable sound all its own, a true blend of old and new, full of enchanting melodies, delicious harmonies, and foot-tapping rhythms. The album “Old Roots, New Leaves” are songs of the 40 to 50ies. Jooya carries the melodies into this century with new interpretation and rhythms into a contemporary exiting style. Her many appearances on the international and world music scene includes “East meets West” at "Stabat Mater" of Karl Jenkins with the Limburg Symphonic orchestra, conducted by Alice Hendrix. Her project “Crossroads” brings together musical traditions which at first glance seem vastly different in a startling organic way. 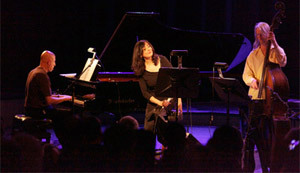 New York and Kabul are 7000 miles apart but become neighbors in the fascinating world of this ensemble based on music arranged by Larry Porter. 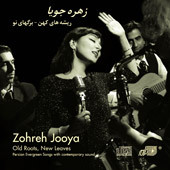 It combines jazz with Persian and Afghan music in such a way as to create a new identifiable sound all its own, a true blend of old and new, full of enchanting melodies, delicious harmonies, and foot-tapping rhythms.